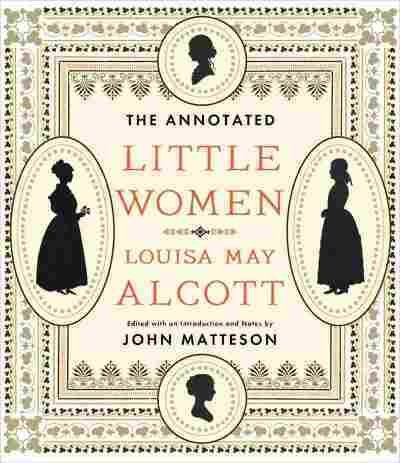 A New Alcott Emerges From The 'Annotated Little Women' Biographer John Matteson crams all his knowledge of Louisa May Alcott into a massive new annotated edition of her best-known book — in which the author herself emerges as a fascinating character. Find someone who's read Little Women, and you'll find someone with opinions about Little Women. There's something almost as comforting about the well-worn arguments as about the book. It's a pillar of a literary childhood, or it's a treacly, preachy domestic fable. Jo should have accepted Laurie, or Jo should have stayed single. Poor Beth, or ... actually, that shouldn't be much of an argument. Say what you like about the overdone angelic child in 19th-century literature, but Beth's death in Little Women carries the weight of biography with it. Alcott's novel is famously drawn from life; Beth's death all the more tragic for being part of a story that's come to be considered an unstudied glimpse into the heart of a real family. But the real art of Little Women is the ways it blends the studied and the unstudied, for a book somewhere in the middle of truth and fiction. The contradictions this suggests are the business (and, evidently, the joy) of John Matteson in The Annotated Little Women. Matteson, who won the Pulitzer for his biography of Alcott and her father, brings all his knowledge to bear on this behemoth edition of the novel, brimming over with artifacts and sidebars that attempt to illuminate this classic novel without defining it. It's harder than it sounds, given the sheer depth of material to cover. The hefty margins collect hundreds of literary allusions (from Dickens to Rasselas), illustrations from previous editions, pictures of the Alcotts' possessions as mentioned in the novel, and recipes. (Ever dream of making Alcott-approved beef tea? Now you can!) It even tries to do its scholarly duty when the content is less pleasant, in a few sidebars about some of the novel's prejudiced racial and cultural assumptions. The only notes that feel superfluous tend to be reading notes, always enthusiastic but not always necessary: Readers of this novel probably don't need to be told each girl's opening dialogue says something about her character. But the most complex notations that emerge behind the scenes are, of course, the story of Alcott herself. Matteson painstakingly chronicles the lives of the Alcotts laid biographically against the novel's plot. Some of it is incidental (Alcott lowered the ages of her sisters, enhancing the bildungsroman angle to their travails), but some is fascinating: Jo's charmingly aggrieved reaction to Meg's engagement was nothing compared to Alcott's real-life resentment of the match — she wrote in her diary of the "great loss" and stayed implacable for months. These notes, which show Alcott sometimes at odds with her work and growing to care for the story on its own terms, bring a fascinating new figure to the table, and change the nature of the read. The harsher, more prickly Alcott that emerges from these margins is this book's most illuminating discovery. Notes on the process of writing Little Women provide great commentary from the horse's mouth (Alcott wrote the book in a hurry and worried for the first third of it that she was working on a dud, and only slowly warmed to the idea of finding her audience in young women) and some suggestions that she was writing a defense of her father, a controversial teacher and reformer, into some of the novel's more pat moral lessons. There's even some old-fashioned trolling: Alcott was so furious with readers who wanted Jo to end up with Laurie that she purposely made Professor Bhaer as odd a love interest as possible, seemingly to confound them. She was equally furious with her publisher for making her include a love interest at all — but her hopes to keep Jo a literary spinster were ahead of their time, and married she had to be. These notes, which show Alcott sometimes at odds with her work and growing to care for the story on its own terms, bring a fascinating new figure to the table, and change the nature of the read. (Those who want their childhood memories of the book untouched will be asked to look with a new eye on Bhaer's moral scolding of the independent Jo, and even his ideological resemblance to Alcott's own father.) But for those with academic curiosity about the workings of old favorites, The Annotated Little Women, it's well worth sitting down with four sisters on Christmas Eve and starting all over again.